GamGam always said every well-rounded person should know three things: how to bake a cake, how to make a toast, and how to change a tire. Fortunately, you can learn how to do any of these on the internet. Whether you’re in the garage or stranded beside the road (thank Zeus we’re good at mobile optimization), there’s no need to worry, Go Auto Outlet is here to help. Follow these 5 steps and you’ll have your tires changed in no time. Find all of the above supplies, and arrange them near your work area. Keep everything sorted and within reach. There’s nothing more frustrating than tripping over the tires on your fifth trip to the tool chest. Ensure the vehicle is on a level surface with the parking brake engaged, and wedge your wheel chocks behind the two tires you’ll be changing last. Now the fun starts. Take a moment to channel your inner Nascar mechanic, and remember Ricky Bobby started his career in the pits. Your owner’s manual will usually include a diagram of your vehicle’s jack points. If not, make contact along the vehicle’s chassis, which are steel beams running from front to back. 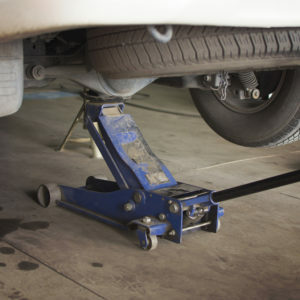 Once you’ve jacked the vehicle high enough that one or two tires hang freely, slide in the jack stands, and lower the vehicle until it rests on the stands. 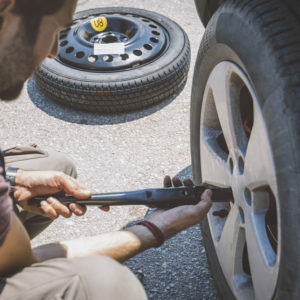 With a tire iron or socket and ratchet, loosen the lug nuts securing your wheel (some vehicles have decorative hubcaps that you’ll need to remove first). Pull your wheels off the studs, so that the brake rotor and caliper are exposed. 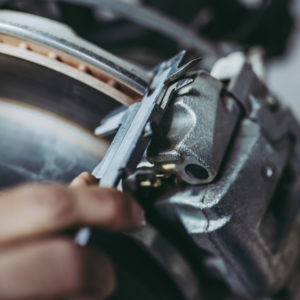 While you’re here, take a peek at the condition of your rotors and brake pads and replace if necessary. At this step, grab ahold of your within-reach new tires, and take a moment to thank yourself for diligently performing step 1. Hang them over the studs and secure the lug nuts, tightening lugs adjacent from each other in a star-like pattern, rather than advancing in a circle. Technically, you should review the owner’s manual and tighten each bolt to the factory-specified tightness with a specialty torque-wrench. If that’s not an option, tighten a little past finger-tight— there’s no need to tighten as hard as you can. Once your wheels are securely attached, clear out any tools from below the car. Jack the vehicle high enough to slide out the jack stands, and then slowly lower it down to the ground. If this was your second row of wheels, open a beverage and celebrate being done. Otherwise, return to Step 2 to finish changing the other wheels. Now that you’ve got your tires back on, feel free to come thank any of the staff at our Red Deer, Edmonton, or Leduc locations. And if even these steps seem complicated, you can always have a certified technician from our YEG Airport Wash N’ Go service perform the swap for you!